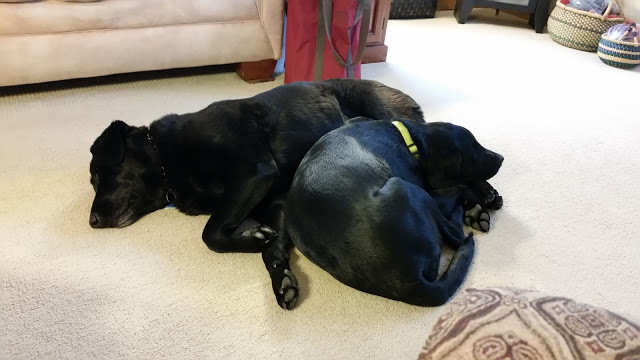 Callie and DeeDee are exhausted! You would think that Callie and DeeDee were the ones who did the shearing or got shorn yesterday. Both of them got up early as usual this morning, went outside briefly, came inside and ate their breakfast then went back to sleep and have been like this ever since. It's now 11 a.m.! I wish I had that luxury and I'm sure Rich does, too. He had to go to work today as did all of the other actual shearing hands. The two dogs just ran around enjoying all of the company and attention. The actual shearing began at two on Saturday, after lunch. Our shearer, Mary Jane, had to finish up at another farm an hour southeast of us first. 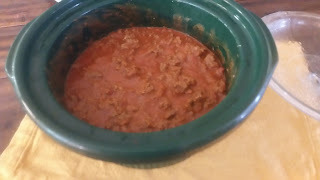 Meanwhile, the Wurm family and Rich and I used the time to set up our potluck lunch and transport their animals from their farm down the road so that we would be ready to begin as soon as everyone ate. As I mentioned earlier, we had so many wonderful workers helping out this year. Lisa, Brian and Darren Wurm brought their animals down along with two of their older sons, Evan and Jerrod, to help out. It was great to have three young men with brains and muscles to help out. Lisa's mom, Chris, came along, too, so we put her to work writing down animal weights as we called them out. 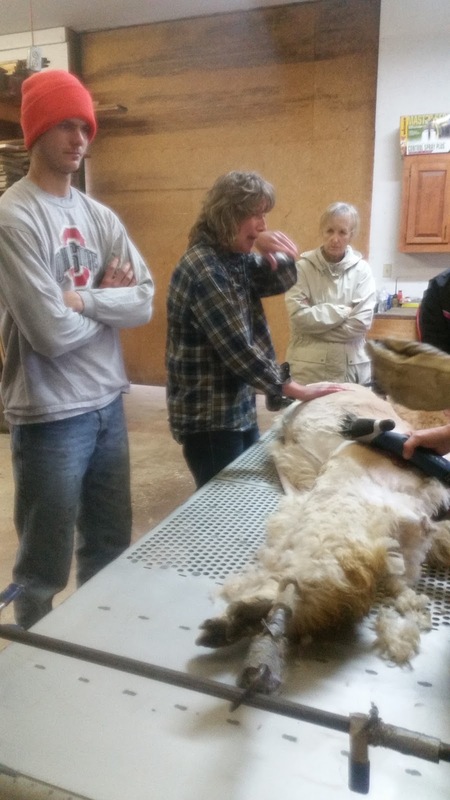 Our good friend, Rhonda, from Grass Run Alpaca farm came up from Bucyrus. She wields a mean broom and helps Lisa and I bag up the freshly sheared fleece and label bags. Everyone worked like a well oiled machine to assist Mary Jane. Evan, Lisa and Chris. The dusty process induces sneezes! The week before shearing, Rich removes any winter bedding from the barn and pasture condos (three-sided shelters) so there is a minimum of straw residue in the fleece. We also release them to the lush, green pastures to graze. This gives them a chance to roll in the grass which also removes straw and other "vegetation" that might have become entangled in their winter coats. We try to have the animals as clean and dry as possible to ease the process. 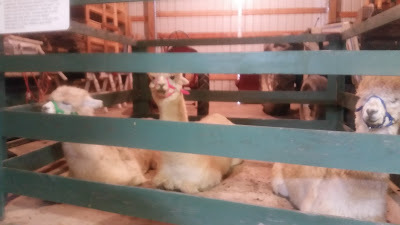 Then the night before shearing day (or sooner if rain is scheduled) we lock the animals inside. Rich tries to keep this lock-in time as short as possible because the alpacas clearly prefer to be outside in most weather. 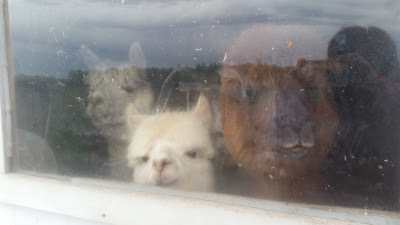 Mango, Aristotle and his mom, Leezza look into the rain until it's their turn. If by chance, as happened this year, it rains on shearing day and some of the animals get a bit wet, we have a holding pen inside the large storage section of Rich's wood shop. It's almost inevitable that a few will get a bit wet when they have to be moved from barn to trailer to transport to the shearing site. We put the damp animals in the pen with large fans blowing on them to dry them out. Addie, her mom, Dora, and Demitrirus (a gelding) relax in the holding pen. Mary Jane is quite impressive as she wrestles the 70-180 lb. animals onto her specially designed and constructed shearing table with very little assistance from her muscled assistants. 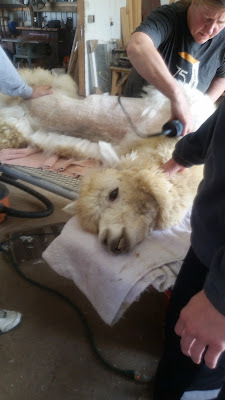 After bungee-ing the animals legs to each end of the table, the first part of the actual shearing process is to vacuum any remaining dust and debris from the fleece. Brian, Evan, Darren and Rich took turns with this step throughout the two day operation. Mary Jane insists on this step and, in fact, brings along her own powerful shop vac as a component of her shearing kit. Not every shearer does this step, but it's very much worth the extra time when I take the fleece to the mill to be processed into the final products. While the vacuuming is going on, Mary Jane trims toenails, files down uneven teeth and removes the males' fighting teeth if necessary. Brian vacuums while Rich picks out debris. 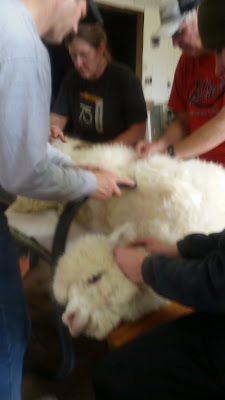 Mary Jane begins shearing the animal on the back to neck area first. This is the precious blanket of fleece that is used to make knitting yarn. The area across the back from the base of the neck to the tail is where the longest and softest staple fiber grows. While the shearer does her job, Lisa and I "noodle" the fiber as it comes off of the animal. 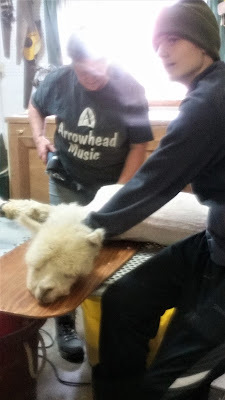 This entails two people holding a plastic painting tarp under the opposite side of the alpaca from neck to tail, and gently catching the fleece in an unbroken sheet as it comes off. The left side of Dio sheared of blanket fleece. After both side of the fleece are gathered in the same tarp, Lisa and I take it to a bare spot on the floor where we fold the long sides of the plastic in an overlapping manner across the fleece and then roll it like a sleeping bag from end to end. We tape it shut, label it, and go back to bag the second shears in trash bags. The seconds are used to make items that don't require prime fleece. I have this made into rug yarn, felt sheets and alpaca insoles. Daren stabilizes the alpaca's head. After removing the blanket and usable seconds, Mary Jane shears the legs and other really dirty fleece. Not much fleece is wasted. 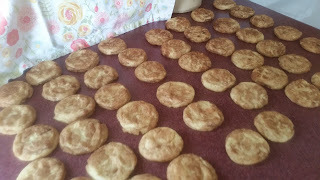 Some people save these dirty thirds for compost. Darren saves this to use as nesting box material for his hens and winter insulation for his bee hives. He is one talented high school junior and has a natural ability to handle the alpacas. The final part of the alpaca spa day process is when Mary Jane holds the head and carefully trims the fleece around the eyes and ears. 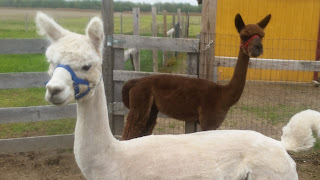 Each animal leaves the shearing barn with a very individual and well coiffed hairdo! 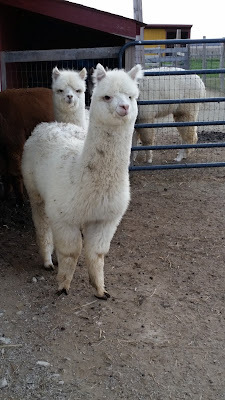 Each alpaca gets walked to the livestock scale for a weight check. Lisa and I keep accurate records of the animals' weights and the weight of the fleece removed from them. We check the strength and condition of the fleece and record these stats for each animal. These are important indicators of animal health and well being. Apollo gets a weight check before returning to the pasture. In two half-days' time Mary Jane sheared eleven animals. Each one was inoculated with a CDT booster vaccine and checked for weight and general health. 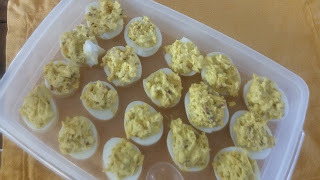 We went through approximately five pounds of cheesy potatoes, three pounds of sloppy joe, four pounds of sloppy chicken, deviled eggs, one large bowl of fluffy fruit salad, breakfast casserole (a dozen eggs), three different types of cookies, two boxes of breakfast bars, one case of bottled water, dips and chips, chips, chips! This is the only time all year that I can eat like this for a whole weekend and experience a weight loss when I step on the scales! At the end of the day after Mary Jane hit the road for home and before sending the last of the Wurm alpacas home, we attempted to set up a "date" with their two-year-old Artie, and our more experienced Leezza. Unfortunately they didn't hit it off this time. Artie's indifference indicated that he was clearly not interested. Maybe it was the trauma of the shearing experience, or the strange surroundings or maybe he needs to mature a bit. We'll try again later. Artie in the foreground as Leezza looks on expectantly. 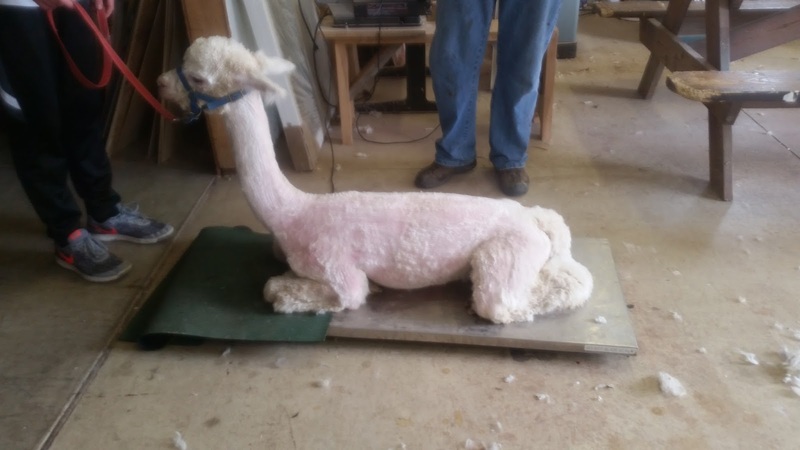 I'll end my tale with a picture of our little Apollo before the weigh in at the end of his shearing. It's amazing how much of the animal is actually fleece. Apollo weighed in at just 80 lbs. after shearing.